Founded in 2013, PATIE is committed to strengthening the communication and exchanges between Pingtan and Taiwan, and helping more Taiwan enterprises seek development on the other side of the Taiwan Strait. 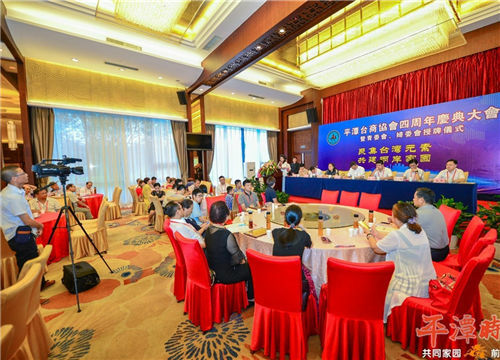 Over the past four years, the association has seen a rapid development as its members increased from 67 to 489, and now plays an increasingly important role in bridging connections between the Pingtan government and Taiwan enterprises. With great efforts, a regular communication channel has been established between the government and Taiwan enterprises, through which Taiwan compatriots'requests are able to be heard and dealt with timely. PATIE has also been long dedicated to promoting the living conditions of the Taiwan residents working in Pingtan, with a community set up in the city. "In the future, PATIE will continue to provide high-quality services for the Taiwan residents, promote preferential policies targeting Taiwan enterprises, and contribute more to building Pingtan into a cross-Straits common homeland," pledged Li Yunhui, president of PATIE, at the celebration ceremony.